Well... We are out. Hate to say it, but I just made a package deal to a buyer for both bikes, various spare parts, bike specific tools, and my Kendon trailer. You know, we wouldn’t shun you too badly if you came in the Miata. I'm still planning to come up in the Spyder... if I can ever get it back from the damn body shop!!! I would do the Miata thing, but we've got stuff going on both ends of that weekend. Simply not enough days in the month. I finally remembered to make my reservation today. I went to the rented garage to swap the Harley for the Uly and the battery was dead so I removed it and threw it in the Harley and it's now charging. I still need to figure out why it didn't start the day I put it in storage. The battery was low but fine then. I moved the bike and everything came to life! Probably the harness at the forks, will find out tomorrow. Anyway, I'll be there on one bike or another! Looking forward to seeing everybody! Ft_bstrd says he probably won't be able to make it. I'm hopeful 2 or 3 people will show up unannounced as happens most years. T-shirts have been ordered and will be delivered at the meet unless you've made other arrangements. We'll be headed up on Saturday, 21 July, in case anyone else comes up early and is looking for some company. 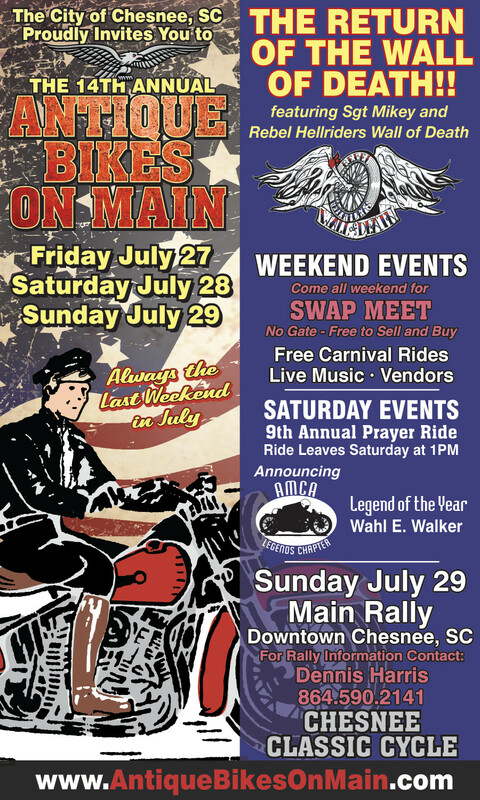 If anybody’s on the fence about coming, or looking for something interesting to do after you get here, the annual “Antique Bike’s on Main” is happening in Chesnee, SC (50 miles south down US-221) the same days as our meet. We’ve been here since Sunday; I’ve put about 200 miles on the EBR riding nearby twisties. Weather has been mixed sun and rain, but that’s normal for up here this time of year and I haven’t lacked for dry riding time so far. We checked out a new brewery in Marion and another in Burnsville; both are excellent. Sadly the Blind Squirrel brewpub in Burnsville closed (their brewery out in the sticks is still open on weekends only) and the Pizza Shop and Dry County Brewing in Spruce Pine, our absolute favorite place up here, has wound down to a Saturday night only operation, and that’s only til they can sell their building. I guess the mountains haven’t quite caught up with the booming economy elsewhere. DANG I wish I could make it. No $$$, and my grandmother-in-law just passed, probably going to her funeral Saturday up in KY.
Request: Hugh, or whomever, if you care to head to the Chesnee shindig, take scads of pictures and post up. That'll be a tonic to my soul. I'm heading out in the morning and it looks like I'll get there Thursday. I need to call Mike and see if I can get another night! Did somebody say BREWERY! Brad- there are usually a bunch of photos of the event on ADVrider; that’s how I first heard of it. Maybe we’ll make it down this year. IF... Gretchen decides not to come, I may ride up. IF... Gretchen decides not to come, I may spend the night and head home Sunday morning. BUT... probably driving up early Saturday, heading home same night. There are many unseen factors at play. I am coming for Saturday regardless. Pre-BITA 8 activities have officially started. Rcontroler just pulled up on his XB9S. I’m hoping Tootal makes it in today. No rain all day today and high in the 70’s. We’ll probably get some rain through the weekend, as we have every other day this week, but we’ll probably also get ~4 hours of sun each day, plenty of time to burn up some twisties. 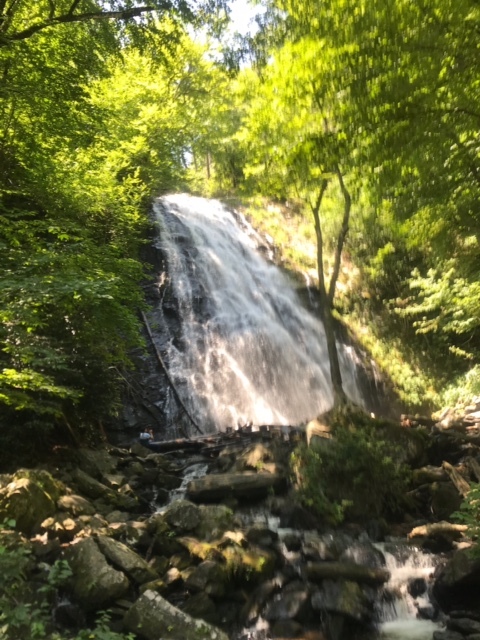 For any of you riding up for the day on Saturday, we’ll get lunch at the Tin Shed at 2598 Altapass Hwy, Spruce Pine, NC (weather permitting, they have outdoor seating). That’s about 5 miles from the hotel. Best hamburgers I’ve ever eaten. I again have no side stand. Going to experiment with dirt bike stand to see if the Uly will make this trip. If not likely be bringing Denali. Will post back as I figure it out. Dang, Vern! You must have used some of those Chinese “great ate” bolts from Harbor Freight. I hope you can make it. Hell, ride it down and lean it against the wall when you get here. Edit- I just saw your post in the other thread. Yikes! What a freak thing to happen. Hopefully your TIG guy will fix you up. Hell, get him to make the boss big enough for a third bolt and install a 2008-up kickstand; that’ll fix it right. Hell, just throw it on it's side! We can have a beer while we paint your muffler! Bringing Denali. On the way! Late start. In Newport area. Grabbing drive through feed bag. See you soon!!! Mars Hill. How y'all doing? Good. Greg and I are hanging out on the deck waiting on you. Not sure what time I'll get there... shooting for breakfast, but got to get Mrs. Anthony up and moving. We've both had a very long week. Awwl, heyull. Vern, just rent a bike for the trails when you get there. Can't believe you just couldn't find a tree or a wall, or a concrete piling to prop that old POS up somewhere. Heck, you and Greg could get a couple of rattle cans of paint and all's well. Vern rolled in last night about 9. 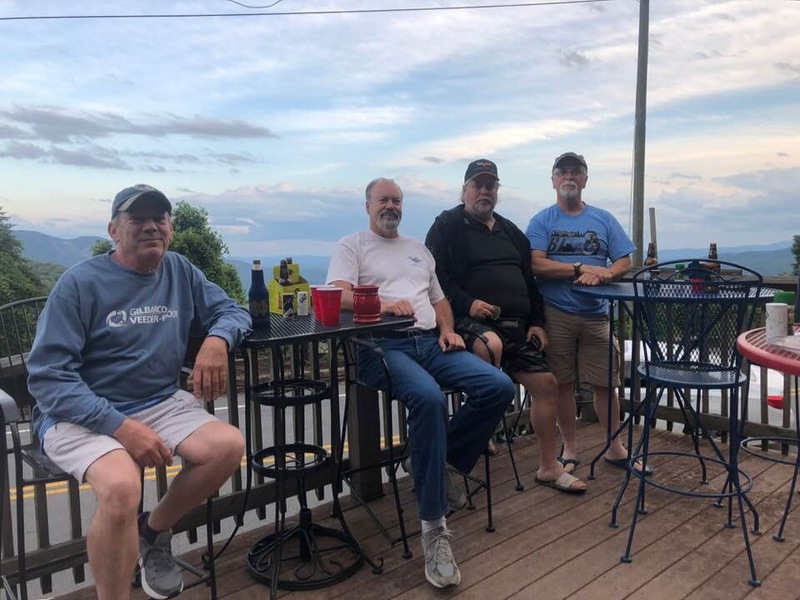 We had a subdued (by Badweb standards) fat-chewing session in the rec room with Greg, Mike, Vern and me until about 11 PM. Don and Darren are also here but they turned in early. We have 3 Buells on site, including two XB9S’s, and a Uly, plus my EBR 1190SX. We’ll keep an eye out for you Matthew; have a good drive. Hugh, Chris and I are planning on swinging by tomorrow morning for breakfast. When would be a good time? We’re headed out to make the “Murder Mountain Run” up into Roan Mountain, TN now. We probably won’t make it back in time for lunch, but we’ll back later this afternoon. Well, BITA 8 is wrapped up. The weather was great- cooler than last year and not a drop of rain Thursday through today. 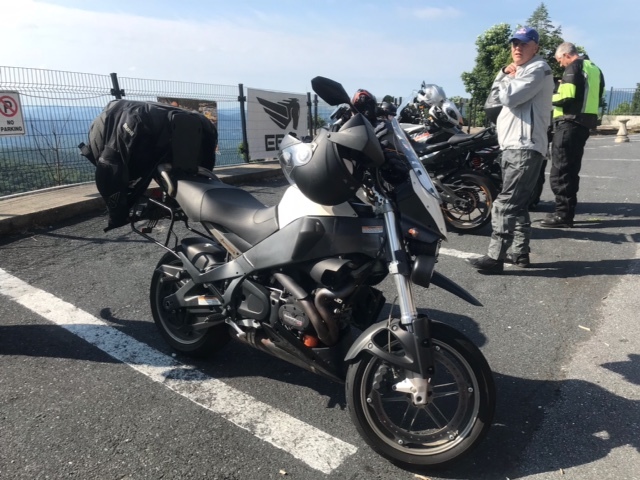 We had two more Buells show up this morning when Cornel (Buelltours) and Chris showed up on their Ulys, which brings our total of Buell motorcycles to 6, including my EBR. That’s Twig, Tootal, Etennuly, and Hughlysses (me). Not shown are Rcontroler and SCBuellcat who made it up for the meet, plus Pwnzor and his wife who drove up for the day Saturday. Here’s Cornel’s group this morning, including two Ulys, a Yamaha FJ09, and a big KTM. 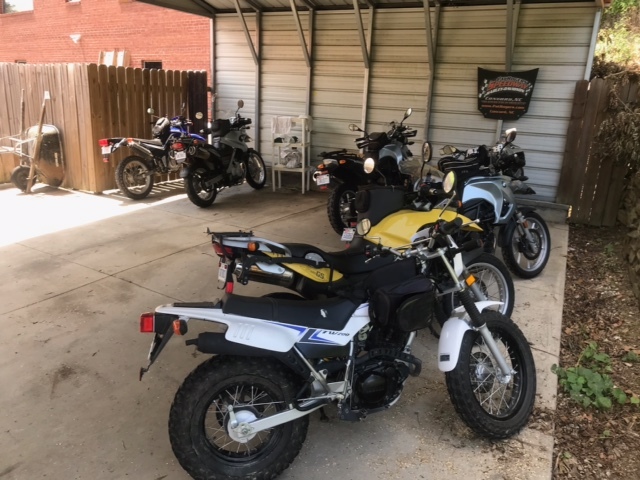 In case any of you didn’t show because you don’t have a bike, here’s a pic of Mike’s rental fleet, including dirt bikes, dual sports, a sport tourer, and a cruiser. It would be nice to drive up in comfort for a weekend sometime and take one of these out. Hopefully everyone made it home safely. It was a good meet but some of our regulars were missing this year. It was good to have Tootal out this year; I told him he needed to bring along a Bueller or two from his neck of the woods next year. I figure I’ll keep this thing going through at least number 10. Really enjoyed doing the murder mtn. run again. Nice ride. Made it home around 12:45. No issues with starting the bike, but the oil light came on a couple of times. Hope to see you guys next year! Had a great time on Saturday seeing you guys and chasing you around. Gretchen also enjoyed it, though she was a bit grumpy getting out of bed at 0430... lol! I'll post her video tonight. It's on the Facebook page right now. Hope to see you miscreants at Buelltoberfest. Glad to hear youn's had a fun weekend! I'd like to take out one of those D/S rentals and go out with a list of trails to check out, hopefully with some water crossings where one could stop for a soak... those falls would have required just that! Per tradition, did Mike put on a big steak dinner or something Saturday nite? That's always a highlight for me, dang but that man and his wife can cook!